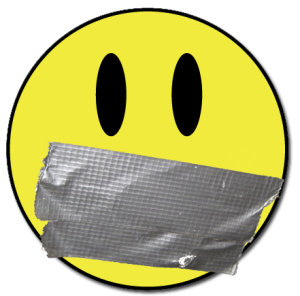 MPD Offers Semantic Defense on “Hazard List” -Sign The Petition! 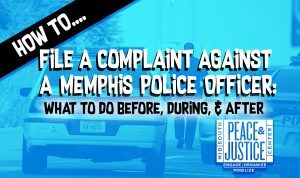 Last Thursday, Memphis United & the Mid-South Peace & Justice Center held a press conference after we learned that anti-violence advocate, and grieving father, Reginald Johnson was told by police that he had been placed on a “hazard list” after filing an internal Affairs complaint concerning a 2016 incident when he was unjustly beaten, maced, and arrested by officers after he called them to assist a man who knocked on his front door after being shot. We called on Mayor Jim Strickland and MPD to release a memo that Reginald be removed from any type of “hazard list” and release a policy outlining the criteria for categorization as a hazard, as well as the process for removal of such a characterization from one’s name or home address. 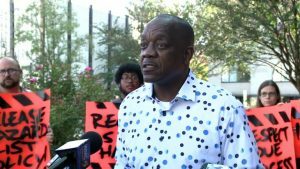 Many community members attended to demand justice for a man who has received ill treatment from MPD since he spoke out to media about the lack of answers and communication concerning the still-unsolved murder of his son, Samuel Johnson, in 2014. Unfortunately, MPD and the Strickland Administration have chosen to respond in the form of semantic games, saying, “there is no hazard list.” It may be technically true that MPD does not maintain a single, compiled list of individuals categorized as hazards, but that is NOT the issue, and both MPD and the Strickland administration know it. They go on to admit that MPD DOES categorize certain individuals’ addresses as hazards. Mr. Johnson doesn’t fit any of those categories. Apparently, his home was categorized as a hazard after one of the officers he filed a complaint against accused Mr. Johnson of making a threat against his wife and child, an accusation that is completely without merit or substantiation. Since then, Mr. Johnson has experienced squad cars driving by his home, shining lights into his windows at night, and back in February of 2017, when his daughter called to file an non-emergency accident report from his home after her car was struck in a hit and run, the dispatcher asked, “Is Mr. Johnson there?…is he okay?” His daughter, confused, asked, “y’all know him?” to which the dispatcher responded, “Yeah…we do.” Four squad cars showed up with lights blazing while one officer took the accident report. Mr. Johnson has met with officials at every level of government to resolve this issue. He has met personally with Deputy Chief Shearin, Deputy Director Ryall, Police Director Rallings, and even Mayor Strickland. For months, he has been promised that they were “working on it” and yet the hazard categorization remains on his home and MPD has not released a policy outlining the hazard categorization. On August 15, The Mid-South Peace & Justice Center made a written inquiry on Mr. Johnson’s behalf, asking them to lift the categorization and release the policy. The only response we received was from Deputy Director Ryall stating, “Thank you, Mr. Garner. I appreciate you providing this information. We have been communication with Mr. Johnson and will continue to do so.” Yet, nothing has changed. This amounts to a form of extrajudicial punishment for Mr. Johnson exercising his right to file a complaint in an attempt to hold officers accountable. Mr. Johnson has not been found guilty of any crime. The accusations made by one officer against Mr. Johnson have never been substantiated, because it never happened. This means that anyone who speaks out against harassment or misconduct may be subject to retaliation without standard due process protections like notice of the accusation and the right to a hearing. Director Rallings’, and especially the Mayor’s failure to act on this issue isn’t just disappointing, it’s unacceptable, signaling a complete lack of leadership and accountability which has become commonplace in this administration. The Mayor’s office told Mr. Johnson that they don’t intervene in police matters. If this is true, then what do we have the Mayor for? The Police Director is not an elected position like the County Sheriff—he serves at the will and pleasure of the mayor who appointed him. When civilians can’t get an appropriate response through MPD’s bureaucracy, it is incumbent on the Mayor to ensure that issues such as these are resolved in a fair and timely manner. We’ve heard Strickland and Rallings offer endless talking points about their commitment to transparency and accountability in government, and yet here is just one more example to the contrary. Semantic games and empty talking points are no substitute for governance. We urge the public to continue to contact their Mayor and demand that MPD release a written memo, removing any “hazard” categorization from Mr. Johnson’s name or home, as well as make MPD’s policy on hazard categorizations public. Reginald Johnson deserves peace and justice, and we as a governed people deserve leadership that is fair and accountable, not only in word, but in deed. We are also asking that you continue to call your Mayor & your Police Director, and tell them to do the right thing. (1) MPD release an official written memo stating that Reginald Johnson’s name and home address be removed from any “hazard” categorization. Say It Like It Is: A Resounding Success! 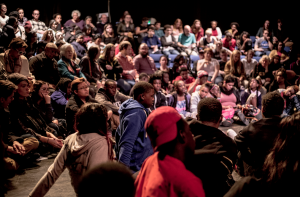 On Friday December 2nd, the culmination of a semester long collaboration between Memphis United and Theatre Memphis made its public debut to a packed house at Rhode College’s McCoy Theatre. 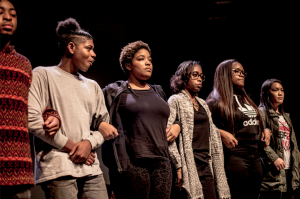 Since September, Organizers with Mid-South Peace & Justice Center’s Juvenile Justice Project through Memphis United have been working with teaching fellows from Rhodes College and Central High School students to create performance pieces that wrestle with issues of social justice under the guidance of the Theatre Memphis Department of Outreach and Education. Mid-South Peace and Justice Center’s main role has been providing resources and local context for the students’ research throughout the process. The day began early for Central High School students who also attended a breakfast and community conversation at Caritas Village where they engaged in dialogue with local organizers and change makers from the Memphis Bus Riders Union, United Campus Workers, Fight For 15, Planned Parenthood, and Mid-South Peace & Justice Center. The debut performance was such a huge success, a second showcase is already in the works for next semester. At Mid-South Peace & Justice Center, we believe that no amount of education or empathy can equal the experiences of those most affected by an issue. They are the experts. They have the solutions. To address issues of youth violence and crime in our city, we must engage with those most affected by the issue…young people. Youth are the SOLUTION, not the problem! Special Thanks to additional performers, Margaret Butta MD Deloach, Nick Black, Brittney Threatt, and Rufus Smith ; Leslie Barker & Lena Wallace Black of Theatre Memphis; Kyamran ‘K-Mo’ Mohammad (who made the beat for the Know Your Rights Rap); photographer; Andrea Morales; Rhodes College Teaching fellows, Karissa Coady, Miranda Colegrove, Emily Murphy, Brynna Newkirk, and Deya Pajarillo; and of course…all of the talented young people from Melrose, and Central High School! Most of us, even us “woke” folks have been well schooled on what we think are our rights when it comes to encounters with police officers. As kids, we all grew up on a heavy dose of cop dramas and movies that have informed our beliefs about the way police interact with the public, and often this has shaped the way we engage with law enforcement in real life either consciously or unconsciously. There are a great many problems with this. While we know that Hollywood and other forms of mass media, are fake and scripted for dramatic effect, it is easy to forget, as the lines between reality and suspension of disbelief have been blurred over years and years of reinforcement by cinematic motifs geared at our sustaining our entertainment. Like many popular dramatizations of police encounters, this scene hinges on the assumption that if police officers don’t read you your Miranda Rights, it’s a get out of jail free card. While this is a idea that is frequently perpetuated by movies and TV shows, it is wildly inaccurate, and has resulted in a general misunderstanding of the way Miranda law functions in reality. Youth Are the Solution, Not The Problem. Join Us! We have all seen the media fueled vitriol about the issues related to youth crime and criminal justice, as well as the great racial disparities in our communities’ approach to addressing these issues. We have seen a response of fear and condemnation but have also seen a lack of comprehensive intervention and holistic alternatives. We feel there is a better way. One of MSPJC core principles, is that no amount of education or empathy can equal the lived experiences of those who have lived under a problem and that those who are most affected by a problem have and are the solutions to said problem. They are the experts. In that to address the issue of youth violence and crime, we have to engage with those most affected by the issue…our young people. MSPJC has been a supporter of Shelby County Juvenile Court’s efforts to better engage the community with court ordered community service and seeks to build on these efforts with our two-pronged Juvenile Justice Project. At any given point in time there are scores of young people who have up to 16 hours of court ordered community service who are unable to complete this in the allotted time, as a result of many issues. Part of the challenge is finding willing partners who want to create meaningful service projects and not simply free labor. One of the other chief barriers is that Juvenile court lacks adequate resources to perform outreach to recruit new partners and the practice of assigning community service by ZIP CODE as opposed to a more neighborhood based approach, means sometimes the available service opportunities are far away from where the young person lives. As a result the process is alienating, lacks parental and community buy in, creates hardships, and adds both needless court appearances and administrative costs. Part of our process has been partnering with SCJC to pilot using GIS (Geographic Information System) software to locate and match up young people with court ordered community service opportunities as close to, if not within, their own neighborhoods as possible. We want to thank the office of Court Ordered Community Service for providing a snap shot of this information and you can see the map we made from such data above. As we continue to work with the courts to analyze this data we will be looking to identify three neighborhoods with the highest concentrations of young people who have unserved court ordered community service. Then performing door-to-door outreach to inform and recruit local churches, neighborhood and civic organizations, and grassroots leaders within these communities into becoming partners to create service opportunities within these neighborhoods. MSPJC workshop at Woodale Middle School. MSPJC would then work with these local leaders and shareholders in convening semi-regular meetings with representatives from each partnering organization that is moderated by the youth from within these communities to discuss and plan more community based solutions around the issue of juvenile offenders. Through engaging directly with the youth, we feel this program could go beyond simply increased compliance with ordered community service, but also remove transportation barriers, secure more community support, and become a vehicle for long-term engagement with a grassroots organizing capacity as well. The ultimate result would be the development of a community led approach to addressing crime that is developed, enacted, and led by youth and adult leaders from the community and for that community. 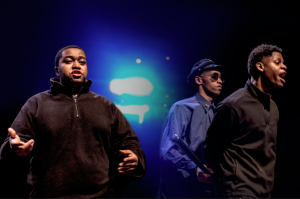 Memphis United, part of the Mid-South Peace & Justice Center is providing free Community Arts programming over the Summer for area youth with interactive theatre workshops that, with the assistance of trained facilitators and experienced local attorneys or former police officers, educate young people about their rights and how to better communicate with law enforcement. 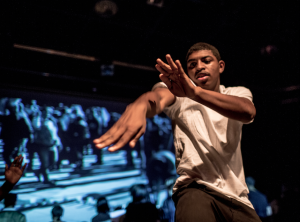 This unique presentation style has already allowed over 250 participants to become actors, role-playing in scenarios that engage our young people in meaningful dialogue to strengthen youth and police relationships. After a review of the information covered, and a time for Q&A, facilitators distribute “Know Your Rights Handbooks”, and participant surveys to help guide the development of this important work. Just last weekend at LeMoyne Owen College, members of of the Memphis United team conducted a KNOW YOUR RIGHTS THEATRE workshop for the event BEING BLACK IN COLLEGE hosted by OUR GRASS, OUR ROOTS. You can watch video of this training below! We again want to thank Happy Jones for her generous donation and we hope that we can count on your support to help us reach our goal.